ING is installing a system to measure the strength of separate turbulent layers in the atmosphere. 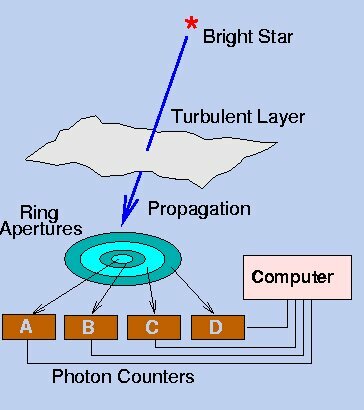 These measurements will assist adaptive optics observations, in particular the use of the Rayleigh laser guide star. The altitude and strength of atmospheric turbulence layers determine the quality of correction attainable by adaptive optics, so that having this information will be very useful for planning adaptive optics observations. There are different techniques to measure atmospheric turbulence. One such technique has been developed by A. Tokovinin (CTIO) and is called Multi-Aperture Scintillation Sensing (MASS). By correlating scintillation patterns in different annular pupils in a telescope the altitude and strength of turbulent motions in the atmosphere, where the scintillation originates, can be deduced. For details on this technique see this page at CTIO. Advantages of this technique are that it requires only a single star for the measurement and it can be carried out with a relatively small aperture telescope. Schematic MASS diagram by A. Tokovinin. MASS systems are now being used by various observatories as a site characterisation tool. 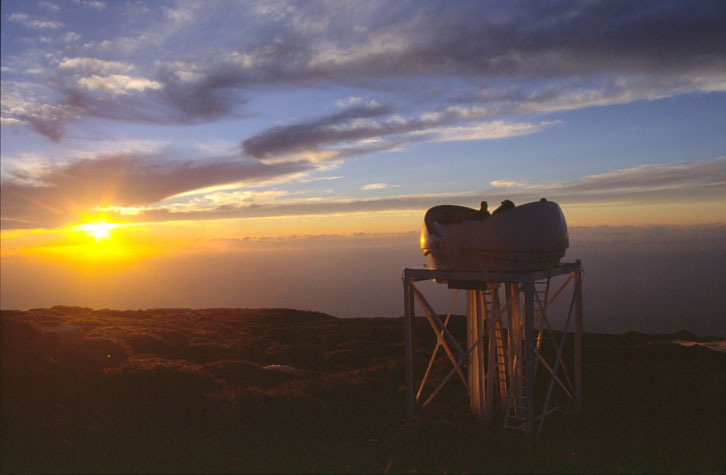 The MASS instrument, designed and built at CTIO, will be attached to a small commercial telescope. The system will deliver on-line actual turbulence strength measurements as a function of height in the atmosphere in a completely autonomous fashion. The telescope has been located on the existing DIMM-tower close to the WHT building, next to the existing RoboDIMM telescope. Future location of the MASS instrument. This project has been made possible thanks to the kind collaboration of CTIO.